Ponoko, an Internet laser cutting shop is in the midst of a Design Challenge for puzzles and games. I've been meaning for a while to look into doing a laser-cut version of my WIM game (below), so I made up a laser-cutting design for it and also created two other puzzles for the competition, one a brand new puzzle, the other a rework of a paper puzzle that I created a few years ago for the National Puzzlers' League convention. I invented WIM a few years ago, inspired by my long-standing interest in ambigrams (you can see several "Roy" ambigrams in the header of this blog). I created the first version with a Sharpie and blank wooden tiles. After play-testing and some tweaks, the next version was created with a better grade of wooden tiles and transparent labels run through my laser printer. It took many hours to put the sets together, but they look very professional, as you can see in the picture. WIM is in the "word tiles" family of games. In WIM, key tiles can be read in more than one direction, sometimes as different letters, which means you can play words "every which way." Scoring is similar to games like Scrabble, but there is no board and players receive bonuses for using a previously played tile as a letter it wasn’t used as previously, for changing the orientation of a word, or for using all seven tiles on their rack in a single play. The picture above shows a partial game. You could probably immediately see the words NIECE, ZEBRA, and JAY, but, given that monitors don't rotate, it may take a little to read everything else. Tilt your head one way for DOZES and the other way for SKIS, FOOTING, and COP. Reading upside down, you can find HUBBY, DOVE, and EONS. Trust me, it works a lot better on a table than on a monitor. WIM isn't the first game that I've invented, but it was the first that I actually think is good. I'm looking into doing a small run of WIM on Ponoko. Stay tuned for that. Next up: Word Dominoes. In this puzzle, you get a set of 20 dominoes that look a lot like regular dominoes, except they have words instead of pips. The dominoes combine, in pairs, to form phrases and compounds words. 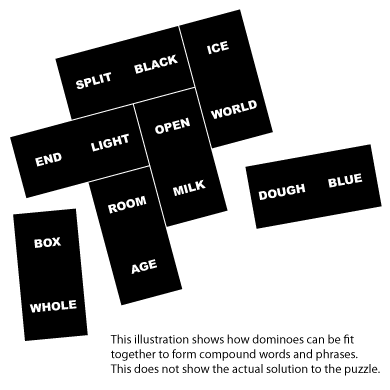 Lay out the dominoes to make a solid rectangle, five words wide by eight words high, in which all connected dominoes form phrases and compound words. There is only one solution. Finally, there's Puzzle Coasters, a completely new puzzle consisting of a set of jigsaw-puzzle shaped coasters with letters on them. My goal was to make an attractive "coffee table puzzle" -- one you could leave out and have fun just playing with, but also one with a real, relatively difficult challenge built in. You can use them as coasters or combine them to form words, as shown below. Or, arrange them to form a 4x4 double word square, which I'm relatively sure can only be done in one way. If people are interested in getting sets of coasters, I might make some. Unfortunately, none of my puzzles made it into the finals of the contest. I was actually a little surprised at some that did make it. Here are my thoughts on the ones that made it, plus some that didn't. To see the entries I'm talking about, go here. You can see just the 17 finalists, on the Ponoko blog. Portrait Puzzle - Clever and attractive use of halftoning (could be beautiful when finished), but not really a puzzle since the spiral means that any piece's location can be determined pretty much independently. Had this been done with the diamond shapes of the Zen puzzle (it's the same designer), it could have been a devilishly clever and fun puzzle, especially if the cut lines came between halftone dots. Ponoku Anyone - Personally, I think it's silly. If there are no givens, it may be unsolvable, or there may be many solutions. Marble Madness - One of the best ideas, but the question is how well the construction actually works. Tessa - Nice use of the tessellations, but it's neither a puzzle nor a game. To make it a puzzle, the shape should have morphed from edge to edge like Escher frequently did. Underground Maze - Interesting and original, though clearly not a difficult puzzle. Layer Puzzle - One of the best puzzles here, but may be easier than it looks. This may be a puzzle you can solve again and again. California County Puzzle - The "puzzle" part of this was provided by Ponoko. The rest doesn't do much for me. Match the Typeface - I don't think this works. It's clearly for kids, but I think they'll be frustrated that the cutouts aren't deep enough to really hold the letters. Build (h)and Share - I like this idea. Tolerances may be an issue for construction and solving. Grimly Dominoes and Erik & Styx Double-sided Puzzle - Are Grimlies something famous that I don't know about? The dominoes don't interest me. The puzzle isn't much of a puzzle, especially with the large percentage of blank squares. Puzzle Box - Nice idea. Clever description too. Again, the question is how well it actually works. And it looks very simple (though there may be components not shown that make it more complex). InterlaceCircle - Also one of the best. Looks like fun. Could also be a repeat solve. Gears - Interesting and Innovative idea. I'm concerned that it might not actually work because of the force applied to the 26 gears over the range of the entire puzzle. A puzzle with fewer gears and larger gear teeth might work better. Might work better as a set of puzzles rather than a single puzzle. Crocodile Ball - I'd like to see a photo of an actual puzzle, but it could be very interesting. The One That Got Away - Yeah, it's a ripoff of a classic Sam Loyd puzzle (and hardly the first such ripoff), but it's well executed and would be fun, particularly for kids. Dante's Icosahedron - Looks like a fun construction, though tolerances might be an issue for it to stay together. Binary Dominoes - An interesting twist on dominoes. Might be fun to play upside down, where all you have is the binary edges (and especially so if you play "touch move"). Using triangles instead of squares for the bits might allow it to be more tolerant of tolerances. Stacking Acrylic Puzzle - Very nice idea, but I think the need to glue pieces together is its downfall. It would also work better if it wasn't so uniform. Catclump - Could be a great puzzle (but could also be made much more attractive). Viking Journey - Nice puzzle in the genre of sliding block puzzles. Would be better if the set itself enforced non-rotation, as puzzles with rectangular shapes do. Om Mani Padme Hum - I have no idea what that means and it's hard to tell how well this will work, but, if it does, it could be very, very cool. Architext: a word-building game - I'm not sure about this one. The description sounds intriguing, but the illustration doesn't show enough. Player Piano - OK, it's neither a game nor a puzzle, but it is cool. Would have been much better if everything was laser cut except the xylophone keys -- I see no reason why the hammers couldn't be laser cut wood. I suspect this is a design adapted from hand-cut wood that needed a little more adaptation. You didn't have a critique of my design "soma three" (I guess it's because I pulled it from my show room rather than it not being worthy of mention ;-P ), so I thought I'd supply my own critique (I didn't make the first round either in case you didn't guess already). http://flightsofideas.com/ - I'd value your feedback. I am surprised that WIM didn't make it to the first round - but I have to admit that I didn't fully appreciate your design until I read your blog (I was lazy and didn't read your showroom instruction sheets - this is by no way a comment on the judges ;-) ). 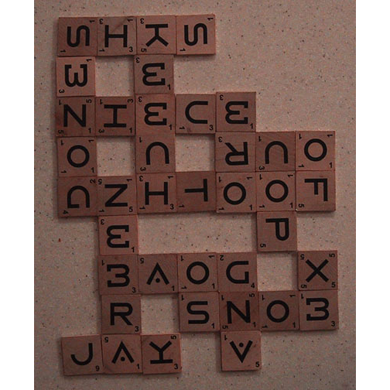 My wife is a wordsmith and would love a puzzle/game like this permanently on the coffee table (I guess that something like this was your inspiration for the puzzle coasters). Looking forward to seeing a product in you showroom soon. @flights: Thanks for the nice thoughts about WIM. I think a number of us failed at describing our entries very well. And, yes, you're right about my inspiration for Puzzle Coasters. I do plan on making some copies of WIM, so your wife can buy one yet! On your Soma cube, a few thoughts. I think the idea of a puzzle layered on top of Soma is a good idea. In fact, I did one myself a few years ago. But, I think you can do better than you did. It might be fun, but it's basically just Soma. Stretch yourself more. Another puzzle that didn't make it was the Sam Loyd ripoff and maybe that factored in. Construction is also a potential issue. I had a couple of 3D puzzles that I was working on that were also constructed the same way (they consisted of either 4 or 8 cubes with rastering on all 6 sides). But, I was concerned that the cubes wouldn't stay together and glue is just inelegant. I'd love to know if/how that works out. You mentioned that you couldn't sell your puzzle with the Fiducial art because of the GPL, but that doesn't make sense. The GPL doesn't prevent Dell from selling a laptop with Linux on it. If the Fiducials are GPLed, you can use them. If you modify them in the course of your use, you must make your modified version available, but you don't have to give away your puzzle any more than Dell has to give away laptops. If they are licensed instead of GPLed, then it's a different story. Even so, I think you could do a better puzzle with different art. Drop me an email and we can discuss more (and I'll send you that Soma cube puzzle that I did a while ago). Some clarifications on the design. My piano design is completely original, and designed from scratch. It wasn't based off an existing design. Basically, it was a "I want to build a piano, okay, let's go about designing it" kind of thing. The hammer design itself went through 4 iterations and testing, because of acoustics and physics issues. Regarding the issue of the hammer not being lasercut, it was because the ball hammer works the best in terms of acoustics. I think it has to do with the surface area and volume of the the ball shape. When the hammer hits the xylophone, not only the metal pieces vibrate, the hammer does as well and both of them affect the volume and resonance of the sound. A lasercut hammer was too thin. I had to throw away my original hammer designs (some of them designed to be lasercut in very beautifully curved shapes) because the notes sounded dead or tinny. They just don't work as well as a ball hammer. @Yanying: First off, please note that I thought your design should have been selected as a finalist. It is very cool. And, just to clarify, I didn't mean to imply that you the design wasn't original -- but it seemed to me that you had originally designed it to not be laser cut -- I based that on the fact that the hammers weren't laser cut. It's possible that the jurors had that feeling too and that's why you weren't chosen. 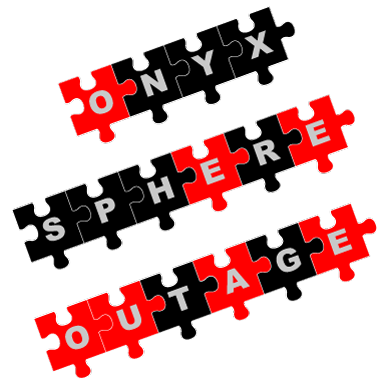 Now that you've explained it, it makes perfect sense -- one side or the other has to be a single point or you get a dead sound, rather than a clean sound radiating from a single point. So, since it's xylophone bars, not strings, they have to be round heads to get that point. On wood versus acrylic, makes sense -- but it is gorgeous in the acrylic. Thanks for the extra info. I'm even more impressed now knowing you designed it from scratch for the contest.